Are you looking to upgrade your floors to something more durable, water resistant, and easy to maintain? Whether you’re adding a whole new room to your house or you’re simply tired of the old-fashioned flooring you’ve been living with, we carry a full selection of laminate flooring in Enid, OK. Because this material is able to mimic virtually any material, it’s perfect for every room in the house. Visit our flooring showroom to take advantage of our low laminate flooring prices, wide selections, and skilled installation services. If you’re not sure which type of laminate tile flooring best suits your needs, stop by to discuss your project with our knowledgeable design experts. We can provide advice and guidance to help you choose the perfect style for your project. The best and easiest way to ensure the longevity of your new laminate floors is to schedule laminate flooring installation by our team of skilled and experienced professionals. Our technicians are able to come to your location to remove your old flooring, fully prepare the subfloor, and correctly install your new laminate flooring so that it maintains its water resistance and great looks for many long years. In addition, all floors installed by our technicians are covered by our Lifetime Installation Guarantee. If you ever experience an installation-related problem, we’ll make it right at no expense to you. Laminate flooring is specially manufactured to stand up to all sorts of wear and tear including children, pets, foot traffic, and even water. However, proper maintenance is still necessary to keep your floors looking brand-new for many years. While laminate repels dirt and dust, it’s important to sweep and mop regularly with an approved cleaning solution in order to prevent your floor from looking dull or dingy. Though it is water resistant, laminate flooring should never be exposed to standing water or bright sunlight for an extended period of time. 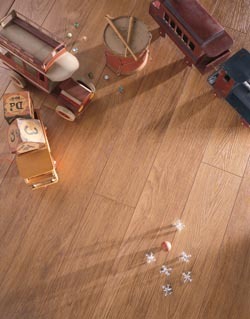 Contact us to schedule laminate flooring installation with our team. We’re proud to serve clients in Enid, Oklahoma, as well as the surrounding areas.